I don't remember how this book made it onto my bookshelves, but it was clearly under a misunderstanding because I had it in with memoirs. So when I picked it up, I was surprised to learn it was YA fiction. But I kept with it because Micah, the main character, is very compelling. So many things about her are fluid or mixed: her gender, her race, her love, and, above all, the truth. Because she is so skilled at depicting herself as something other than her true self, each revelation in her story is surprising and gives the reader an opportunity to think back and reevaluate the story at it has been told up to that point. And the central conflict is a murder mystery, which kept me engaged in the story. 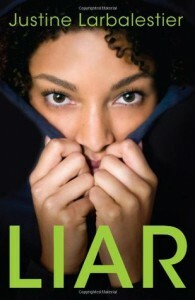 Most reviewers have been put off by Micah's duplicity, which is condescending at times, and especially by the ending. I agree that the author should have committed more on both accounts. The ending is what kept me from giving it 4 or 5 stars. I'm looking forward to Larbalestier's next book, which will be published next month and which has so far been getting much less equivocally positive reviews.